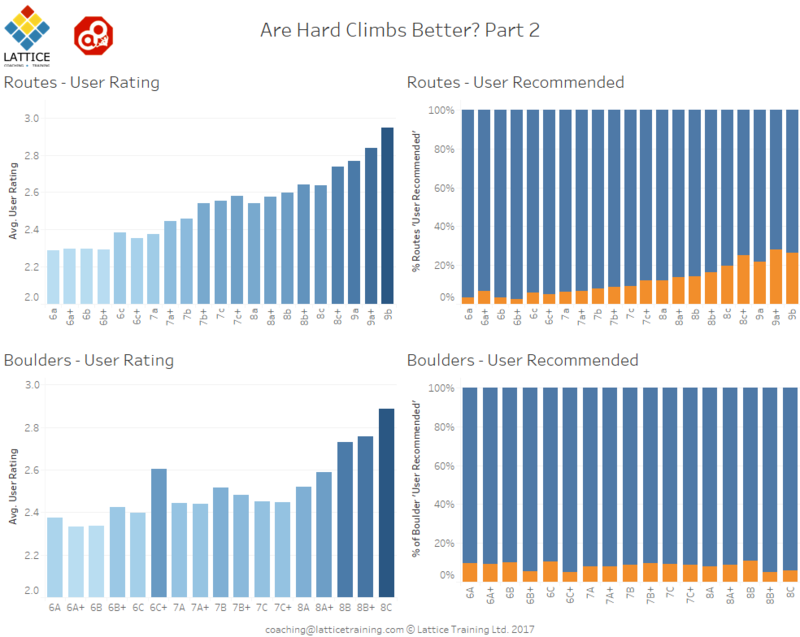 For both routes and boulders, we see their is a significant decrease in the proportion of 0 star ratings given as grade increases. This begs the question, are these 0 star ratings ‘real’ or are they users choosing not to rate their ascent? If it is the latter then we should take out these ratings, as they’re not really ratings at all. Another option is to simply remove all the 0 star ratings from consideration. This isn’t ideal because we might be removing some real 0 star ratings from the mix, but hopefully if a given grade gets lots of 0 star ratings it’ll also get enough 1 star ratings to keep the average rating low. 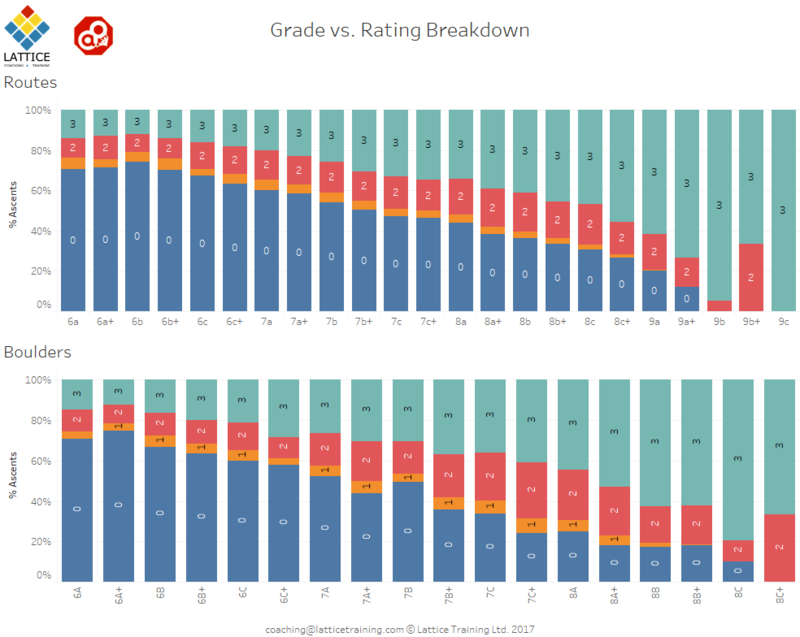 Note that there is a significant difference in the scales used on the User Rating graphs! Whereas in our original analysis the lower end of the scale was starting at a average rating of ~0.7 stars we’re now starting at a rating of ~2.3 stars. 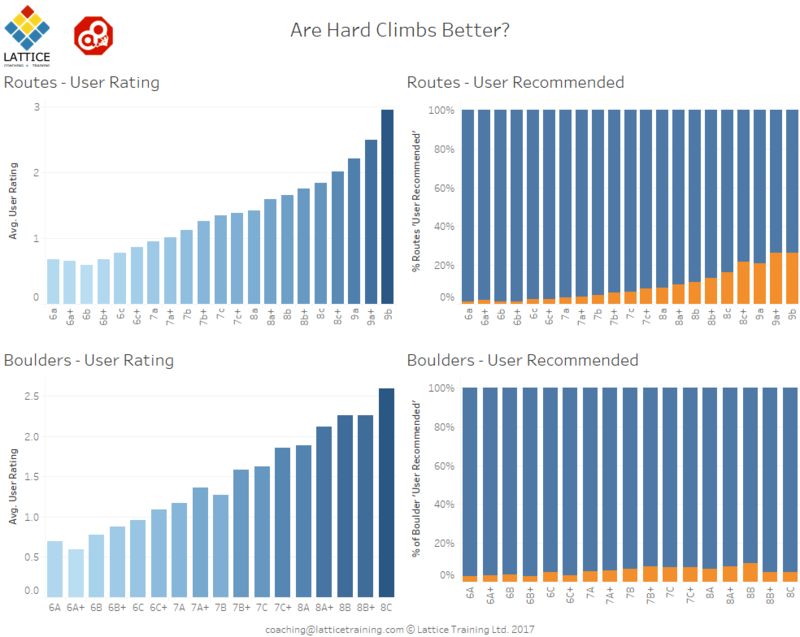 Interestingly it appears that hard routes still get a higher rating, though the effect is smaller than was suggested in the original post. It’s not clear that the trend is present for boulder problems, though. Thanks again to NP for spotting the issue. Isn’t “hard” quite subjective? If you are climbing at 7b you’re going to rate hard differently to someone climbing 8c+. Duh, the best routes at the crag are nearly always the hardest ones! That’s we all train our asses off and spend all winter hanging from our fingertips in the cellar!